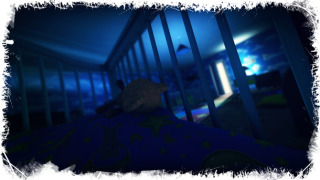 Among the Sleep, the atmospheric horror game in which you play as a baby, is now on Kickstarter with the hope that fans will support it as it makes its final steps toward release. Though the game is feature complete, the devs at Norway's Krillbite Studio say the $200,000 in crowdfunding would allow them to turn some of the part-time team into full-time developers as they seek to round out the sharp corners and put those plastic protector things on the light sockets before letting us loose from the crib. "We're now at the point in development where we have finished the core gameplay and levels, but there is still a lot of production, and a ton of polishing and testing left to do. We want to take our time and make the game as good as possible," the Kickstarter page reads. "The only obstacle we see going forward, is that everyone at Krillbite still work part time jobs on the side to survive while developing Among The Sleep. This inhibits our focus and productivity on the game, and we don't want to lower our expectations to the quality of the finished game, or delay the release. We hope this Kickstarter will help us deliver the best possible experience we can, within a reasonable timeframe." If you're curious, you might find our hands-on preview from GDC informative. Aside from Kickstarter, you can also read more about the game on the official site .